Susie Jaramillo's Elefantitos is a bilingual counting board book based on the folk song "Elefantitos". It is in English and then in Spanish, with brightly colored numbers and elephants balancing on a spider's thread. The board book has little tabs to make the elephants move; unfortunately, I had the digital version to look at with my children and couldn't make the display change. There isn't any indication of how the song should be sung, which would be more problematic for those of us that didn't grow up learning it. It's still a cute little poem for young children, especially if they like elephants. That sounds like a fun book! My grandkids might like that. It really is fun, and a great way to introduce children to other languages. I love the bilingual books. I continuously ask myself how to raise a global child. Exposing my child to languages and different perspectives is one of the strategies I use. Great choice for the blog hop. 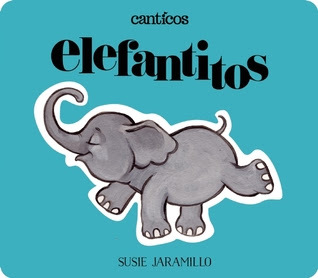 It's great, and the author has a lot of other bilingual books if your child likes this one.